Should Malinga make a Test comeback? “Why do they want to do that, thaaththa?” Bindu wanted to know. “They seem to think that it doesn’t serve any purpose,” Percy said. “Who says so?” Bindu asked. “Why, Gotabaya maama was the first to suggest that,” Percy recalled. “And why does he think that we don’t need the thirteenth amendment anymore?” Bindu wondered. “What did the thirteenth amendment do anyway, thaaththa?” Bindu inquired. “That is the amendment that created the provincial councils, Bindu,” Percy said. “Then I understand why he wants that amendment removed,”Bindu said. “Why do you say that?” Percy was puzzled. 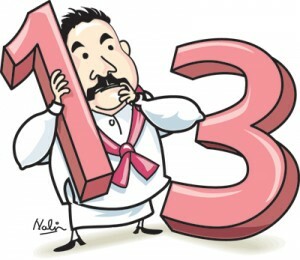 “Why thaaththa,” Bindu said, “If we didn’t have the thirteenth amendment, we wouldn’t need to have all these provincial councils,” Bindu argued. “And why is that good?” Percy asked. “That is true,” Percy agreed. 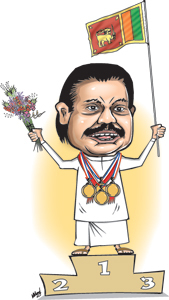 “And it will be good for Mahinda maama as well,” Bindu said. “That is also true,” Percy conceded. “So, who else wants the thirteenth amendment removed?” Bindu asked. “I suppose he could stage a fast unto death in front of a provincial council now,” Bindu said. “And then call off the fast after three days even if nothing happened as a result of the fast,” Percy observed. “That is also possible,” Percy agreed. “Is there anyone else who is demanding that the thirteenth amendment be removed, thaaththa?” Bindu asked. “Well there is Uncle Champika as well,” Percy pointed out. “He may not stage a fast unto death, so no one really takes notice of what he has to say,” Bindu declared. “There is also Uncle Dinesh who is making the same demand but no one really listens to him these days,” Percy said. “Why do you say that, thaaththa?” Bindu demanded. “Why, he said he was not even aware of plans to impose a tax on water wells even though he is the minister in charge of the subject,” Percy recalled. “And who are they?” Bindu was curious. “Why there is Uncle Rauff who is furious that they are even considering removing the thirteenth amendment,” Percy remembered. “Why do you say that?” Percy asked. 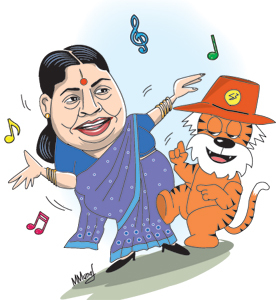 “Why, thaaththa, he did so first with the eighteenth amendment and then again with the elections for the Eastern Province,” Bindu recalled. “So, is he the only person who wants to retain the thirteenth amendment?” Bindu wondered. “But that makes this very confusing, thaaththa,” Bindu complained. “Why is that, Bindu?” Percy asked. “I don’t think he quite meant it that way,” Percy argued. “And Uncle Dinesh would, I am sure, resent being accused of a conspiracy,” Percy pointed out. “What about them?” Percy demanded. “Since the thirteenth amendment was their creation many years ago, what do they say about it now?” Bindu wanted to know. “That is easy to predict,” Percy said. “Why is that, thaaththa?” Bindu asked. “Why, Bindu the Greens will be ordered not to speak about it publicly and they will also be ordered not to attend any public meetings that would be held to protest the thirteenth amendment,” Percy declared. Bindu didn’t disagree with that.